Oi! Punk band from Boston, MA, formed in 1996 by Ken Casey (bass/vocals), Rick Barton (guitar) and Mike McColgan (vocals). The band is known for its Oi!/punk sound, its frequent covers of Irish standards, and lyrics which often focus on unions and working class ethics and concerns. In 1998, the band signed to Hellcat Records, a label run by members of Rancid and connected to Epitaph Records. After the release of their first LP, "Do Or Die", Mike McColgan left the band to pursue his desire to become a firefighter. The split was amicable and McColgan would return to music a few years later, fronting the Street Dogs. He was replaced by Al Barr. Rick Barton left after the band's second album, "The Gang's All Here" to pursue outside interests. By the release of their next album, "Sing Loud, Sing Proud", the band had expanded to include Casey, Barr, longtime drummer Matt Kelly, 2 guitarists, a mandolin player, and a bagpipe player. In 2004, the Dropkick Murphys recorded and released the song "Tessie", an old tune associated with the Boston Red Sox baseball team. The song was featured in the movie "Fever Pitch". In 2006, the band recorded "I'm Shipping Up To Boston", which used lyrics from an old Woody Guthrie poem and was featured in the movie "The Departed". It remains perhaps their best-known song. 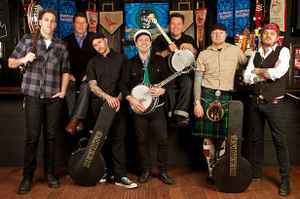 In 2007, the Dropkick Murphys formed their own record label, Born & Bred Records, to release their material.